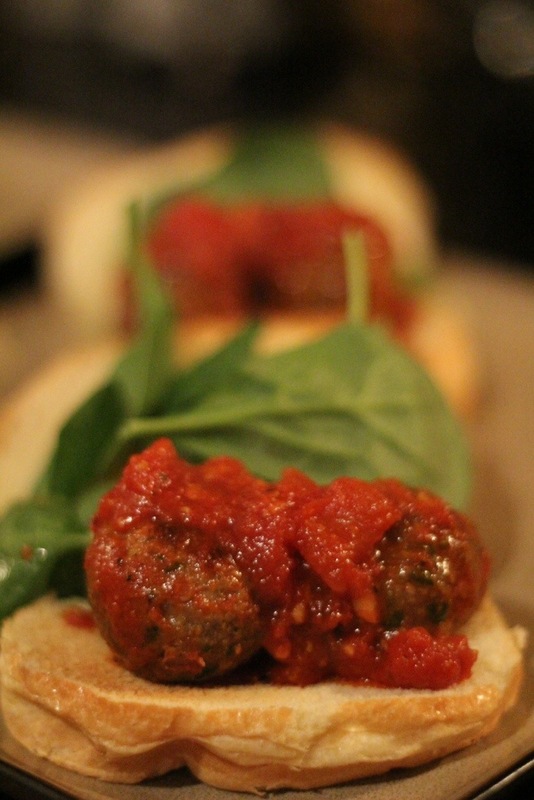 One of the not so healthy things I always find myself craving is a meatball sub. Nothing beats the combination of savory meatballs in marinara sauce, tons of melty delicious mozzarella wrapped in a toasty roll. So I decided to give it a try and attempt to make a healthier, lighter version at home so that maybe I can have them more often 😉 I opted for a lean 95, 15 ground beef, brioche buns from the Whole Foods bakery, mozzarella, and baby spinach for a little something green. The sauce is super light and if you have left overs I would highly recommend boiling some noodles and having a bowl of good ol’ spaghetti and meatballs. Bake at 350 for 25 – 30 minutes. Heat the oil over medium. Add the onions and garlic and sauté until the onions are translucent. Add the celery, carrots, and 1/2 teaspoon of each salt and pepper. Sauté until all the vegetables are soft, about 10 minutes. Add the tomatoes and bay leaves, simmer uncovered on low heat until the sauce thickens. Remove the bay leaf, and toss in the meatballs!